Styles allow you to define a set of properies of an object, that can be reused across your team's designs. Apply a Style to an Object. Detach an Object from a Style. Use Styles from your Team Libraries. 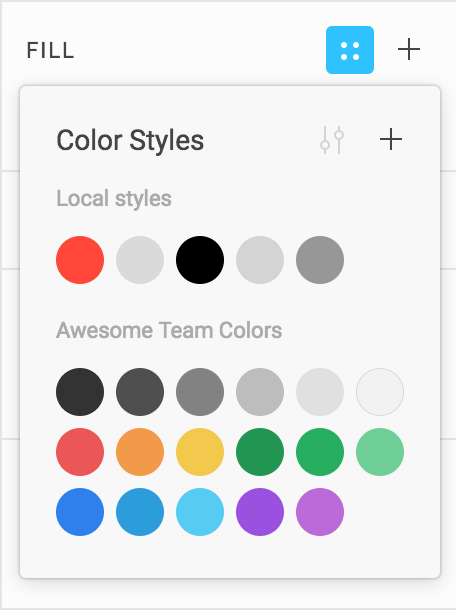 You can apply any Styles from your Local Styles, or apply shared Styles that you've published to your Team Library. Select the object(s) you'd like to apply the Style to. In the Styles menu, you will see your Local Styles and any Styles shared via the Team Library. Styles will be ordered alphabetically by team name, then file name. Tip! If you aren't able to access Styles from the properties panel, they may not be shared to your Team Library yet. Learn more about sharing Styles in our Managing and Sharing Styles article. 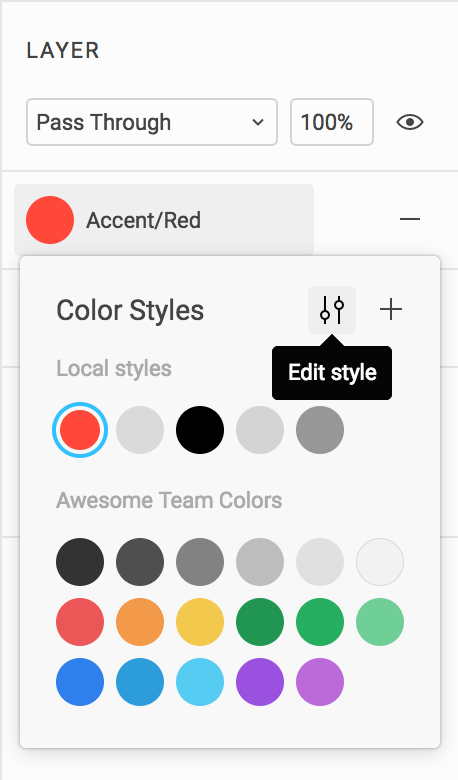 When you're using the Color Picker, you will be able to switch between Document Colors and any Color Styles shared via your added Team Libraries, using the drop down field provided. When you pick a color from this section, you are only setting the color, not applying a style. 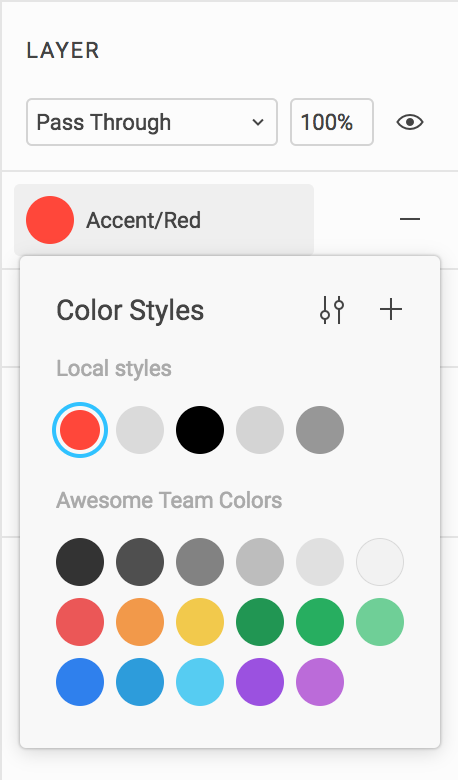 Create a custom color that matches only some of a Style's properties. For example, to create an object with the same color as a built-in style, but at 50% opacity. Apply a Color Style to an object or layer that doesn't in a place that doesn’t allow styles. For example, setting the background color of a frame. Learn more in our Using the Color Picker article. If you want to change the Style that is applied to an object, you can do this from the Style section in Properties panel. Select the object(s) you'd like to update. In the properties panel, click on the relevant Style. Select the new Style from the options to apply the Style to any selected object(s). If you no longer want an object to use a specific Style, you can detach the object from the Style. This will allow you to edit the object’s properties again. Select the object(s) you'd like to remove the Style from. In the Properties panel, hover over the relevant style. You can now make any changes you want to the object, independent of the Style. When a Library is enabled, you’ll see the Styles from that Team Library included in the Style picker. 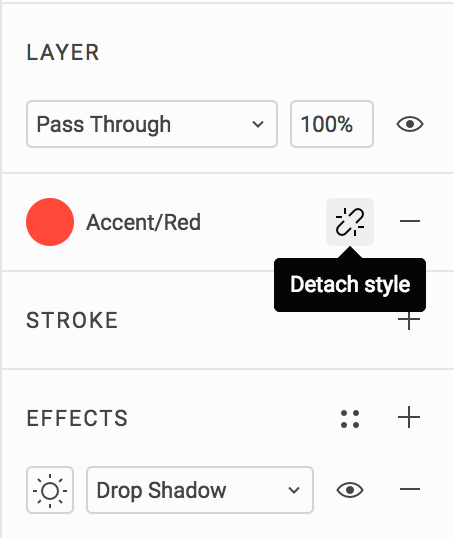 You can use any Styles that are shared with you, but you may not be able to edit them.